AECOM is HIRING HBCU Graduates! From around the corner to around the globe, AECOM’s team of dedicated professionals work to create, enhance and sustain the world’s built, natural and social environments. AECOM is a global provider of professional technical and management support services to a broad range of markets, including transportation, facilities, environmental, energy, water and government. With approximately 45,000 employees around the world, AECOM is a leader in all of the key markets that it serves. AECOM provides a blend of global reach, local knowledge, innovation and technical excellence in delivering solutions that create, enhance and sustain the world’s built, natural and social environments. AECOM is now working on six of the 20 largest civil infrastructure programs in the world. More experts. Thinking more innovatively. Designing more intelligently. Managing more productively. Partnering more powerfully. Banana Republic is HIRING Seasonal Sales Associates for the Holidays! Do you love fashion? Do you have a sense of style? Do you have a passion for selling? If your answer to any of those questions is an enthusiastic ‘Yes!’, then YOU may be the person Banana Republic is looking for to join their team this holiday season! Perfect for college students looking for a job during their Christmas Break or anyone generally looking for employment! Enjoy exceptional DISCOUNTS across Gap Inc. and be apart of a WINNING team! Disney Dreamers Academy is a unique opportunity where the team helps to inspire, motivate and empower youth as they begin their journey to a future full of promise and endless possibilities. What do all Dreamers have in common? They’re creative, eager to learn, and dedicated to pursuing their dreams with passion. Does this sound like someone you know? The Disney Dreamers team is looking for Dreamers for next year’s Disney Dreamers Academy, so tell them who you think should be the next Dreamer invited to this powerful program, so they can get the tools to help make their dreams come true. Potential Dreamers must be between the ages of 13–19, live in the United States, and be enrolled in high school grades 9–12 when entering. For a complete list of rules, click here. The Disney Dreamers Academy is packed with wonderful experiences that motivate, inspire and prepare the young Dreamers to reach even further when making their dreams come true. The powerful four-day program takes place in the spring, and each day’s theme gives you a taste of the magic that takes place each day. Everything on the first day helps to fire up the imagination of the young Dreamers and get them excited about the incredible possibilities that will be opening up for them. The Dreamers take all of their dreams one step further by diving into career workshops where Dreamers encounter special experiences created to really motivate and inspire them. This day’s theme adds in the powerful element of professional mentors. Dreamers interact with successful people from all backgrounds and received the unique opportunity to network with the real-life examples of dreams coming true. The final day marks the graduation ceremony and the beginning of the Dreamers taking their new tools and using them to follow their dreams. And that’s not all! Various celebrity guests participate in different activities throughout the program: encouraging Dreamers along the way throughout the four-day experience. Click Disney Dreamer Application to download the application to apply today! Visit https://www.mydisneydiscovery.com/dreamers-academy/apply/ to register and apply online! Interested in technology? Here’s a GREAT opportunity! Begin a career in technology TODAY! No experience necessary! 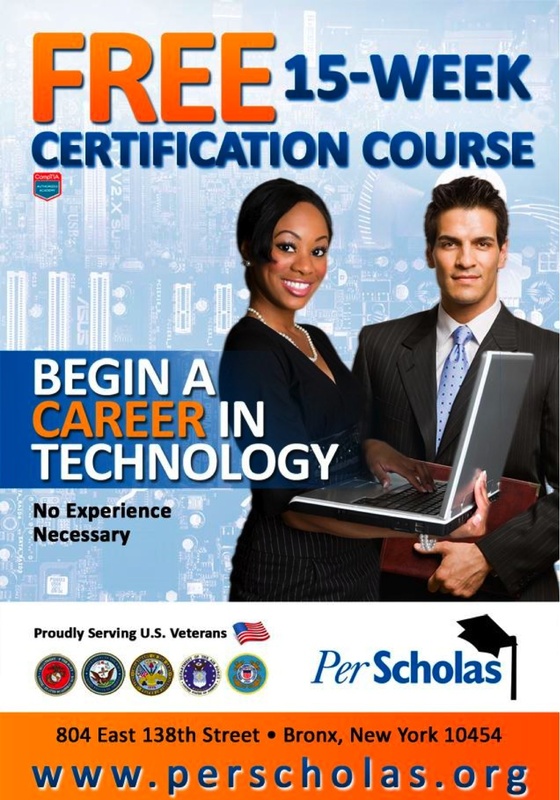 85% of Per Scholas graduates land IT jobs!! – FREE tuition: ALL books, exams, and materials are INCLUDED! MORE Manhattan Jobs ARE HIRING!